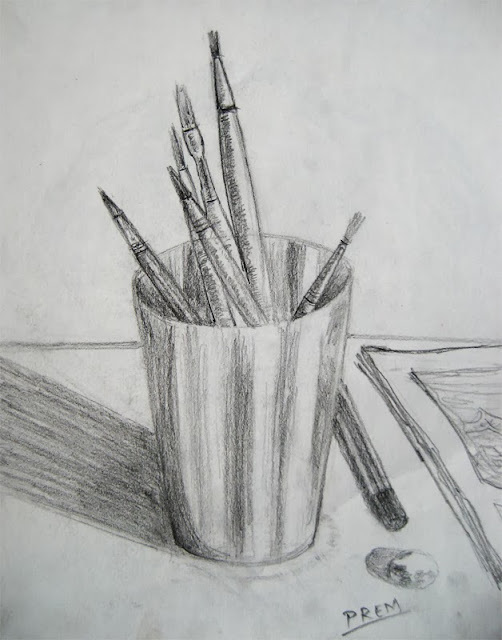 Still life arts refers to portraying inanimate objects such as glasses, vases, flowers, fruits, etc. In this art, the scene can be composed by artists by placing the object in the desired manner. However, at other times the objects are portrayed without further composition. The objects are not disturbed until the artwork is over. In this sketch, I drew brushes which I usually place in the glass as shown in this sketch. The scene is of my table where I have my art related stuffs like pencil, brushes, eraser, etc. This is my first active try at sketching still life.